As of 6/19/15, this Daily Math Review file also includes an editable version. The EDITABLE feature of this file is that you can change ANY of the text boxes and mathematical graphics to suit your students' needs. I created the mathematical graphics using Powerpoint, so as long as you have Powerpoint and a working knowledge of the program, you will be able to alter the pages. 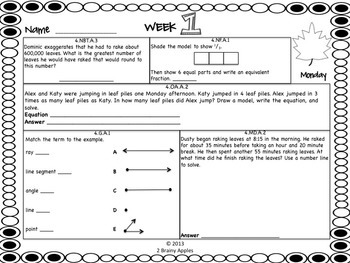 I have still included the original Daily Math Review pages if you prefer the original. Please note you will NOT be able to alter the clip art graphics. These have been secured as a jpeg with the text boxes layered on top. You can ONLY edit the text boxes and mathematical graphics. 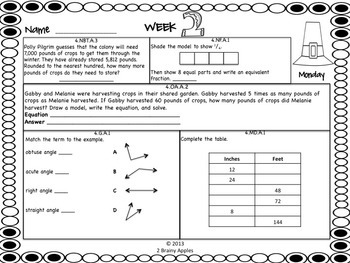 You may ONLY use the editable Daily Math Review pages for your own classroom. You may NOT redistribute, publicly post, or sell any revisions made to this product. I created the editable features so you can adjust the pages to match your students' needs. 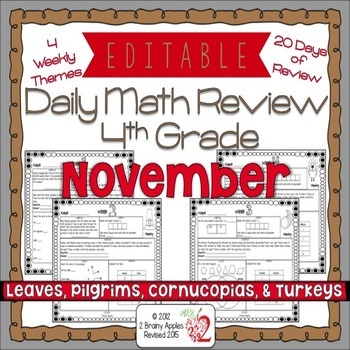 THIS REVIEW IS INCLUDED IN MY 4TH GRADE DAILY MATH REVIEW BUNDLE FOR OCTOBER, NOVEMBER, & DECEMBER. SAVE OVER 10% BY PURCHASING THE BUNDLE! As a classroom teacher, I strongly feel that skills should be reviewed on a regular basis so students stay sharp. I wasn't able to find a book that had a daily math review that was Common Core aligned…I didn't want my students to bother answering questions if they weren't responsible for learning it, so I created my own. This document is a spiraling daily math review of the Common Core State Standards for 4th grade. There are 5 domains in 4th grade. Every day there is one question per domain for a total of 5 questions. Each problem is labeled with the exact standard. No more guessing if a question is CCSS aligned! That means each week your students will be practicing 25 spiraling CCSS aligned math problems a week in addition to your normal math instruction! By month's end your students will have had a chance to complete 100 extra math problems that won't take much of your instructional time. There is also a standards checklist that you can use to record your students' results. I have also included a black and white cover page in case you want to make a monthly packet for your students ahead of time as a way to keep their papers organized. This would be a great tool for parent communication as well as a convenient way to keep data. Answer keys are included for easy grading. Want to try before you buy? Try a sample week for free! Be sure to follow our store so you will be notified of new releases!